I rarely eat at my desk. But when I really have to eat while I’m working my lovely missus usually makes me something I’m extremely partial to. 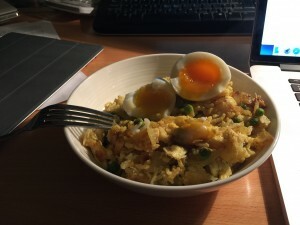 Home-made Kedgeree is one of those dishes. If you’ve not had it before, it consists of cooked, flaked fish (traditionally smoked haddock), boiled rice, parsley, hard-boiled eggs, curry powder, butter or cream and occasionally sultanas. We put peas in it too. I’m not saying it’s good for the waistline but it’s definitely good for the soul. Brought back from India by colonials in Victorian times when we Brits were relentlessly enslaving as much of the world as we could, it was traditionally served as a breakfast dish that would use up the leftovers from the previous night’s curry. Ironic then that last time I had Kedgeree for breakfast – this money-saving leftovers dish – for breakfast, it was in a £200 a night 16th Century hotel and the Kedgeree cost MORE than a night out at the pub! I like smoked fish – cod, haddock, Salmon especially – so this sounds intriguing i have not had ‘Kedegree’ but of course all the ingredients are familiar 🙂 We lucky men who have gorgeous wives to look after us (and us them in return of course) -count the blessings eh?